Only available in Hong Kong right now. Currently $75.64 + shipping. If you feel compelled to add yet another Bruce Lee upgrade to your collection. Fans of the Dragon should know that Shout has remastered the movies once again for Blu-ray since their box set in individual editions. Interesting how they have the blu ray banner black to confuse people with a UHD release. If this were an actual 4k UHD, I'd be really interested. At any rate, I'm curious to know how the PQ is on these. Since these aren't UHD BDs (although, boy, they sure want you to think they are! ), I updated the title. Oh wow, I didn't realize it wasn't a UHD. The packaging is kind of deceiving then. 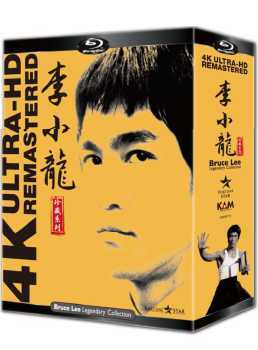 I really don't need to add anymore Bruce Lee content to my collection, so I'm probably going to pass on this. Although I might be traveling to Hong Kong in late May, so I may check to see how much it costs in 4 months. If you're interested in the new 4k transfers, the new shout individual releases are your best bet. They were released under their American titles and only the first two are out so far, but they've been color corrected (the HK versions have a heavy yellow tint) and have all of the original soundtracks. Looks like the Shout versions are getting good reviews. I might just go for those because I want the English dubs. I understand the Mandarin and a bit of the Cantonese but I prefer the English dubs. I grew up with those. I might pick up Shout's new version of The Chinese Connection to replace the disc in my Shout box set. Sounds like it's a noticeable upgrade. Can we maybe get remasters of the other 149,256 HK films in need of them now? Last edited by hanshotfirst1138; 02-11-17 at 01:26 PM. Can we maybe get remasters of the other 149,256 HK films in need of them now. Hear, hear, but because down deep I know that day will never come, and since the worst thing about Hong Kong cinema is the alleged fanbase in the west that keeps heaping praise on DVD upscales, "fan edition" bootlegs of privately-held films, 7-point-whatever "remixes" of friggin' original mono soundtracks and endless mildly-improved re-releases of the same hundred or so quintessential movies (including the Bruce Lee pictures), I long ago happily resigned myself to simply acquiring and seeing as much Hong Kong cinema as I can, in any legal format I can get it, especially now that in it's purest, happiest form -- i.e. from the silent era until a few years past the handover -- it's pretty much trapped in amber for all eternity. If that means loading up on dollar VCDs and letterbox DVDs and even old VHS tapes (!) from the mustiest, dustiest corners of this city's multiple Chinatowns in addition to near-weekly shipments of discs from the city itself and elsewhere, it's a hobby I'm only too happy to indulge. Return of the Dragon (Collector' Edition) and Game of Death (Collector's Edition) are out May 16th! These are both new 4K scans, restored from the original negative, and Game of Death is a 2-disc set. Stay tuned to our Facebook page for more info, including bonus features, soon! This exhibit is already over but did anyone get a chance to go? They were showing the 4K restorations. View Next Unread What is this manufactured on demand BD-R?